Shadow-Caster LED Courtesy Lights come in two finishes. Stainless Steel and White. There are four color options to choose from. White, Blue, Red, or *RGB (Color Changing). In the Stainless Steel box, click on the drop-down menu under “Choose Your Color”. A list of the four color options opens up along with the price. Click on the color you wish to order then click “Add To Cart”. You will be taken to the shopping cart where you can choose how many Stainless Steel lights you want to order. In the White box, click on the drop-down menu under “Choose Your Color”. A list of the four color options opens up along with the price. You will be taken to the shopping cart where you can choose how many White lights you want to order. 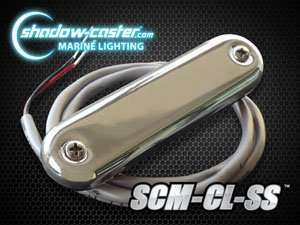 *RGB (Color Changing) LED Courtesy Lights can only be operated through the Shadow-Caster SCM-ZC.